We have so much to be thankful for in this busy, hectic world. Even when our purse strings are tight, our family has more than other families. I'm thankful to have Giant Eagle's Advantage Card for helping to stretch our budget. The more we shop, the more we save! What's special about Giant Eagle Advantage Card? Only big savings with the Fuel Perks Plus program! Discounts are available on GetGo’s gas and prescription copays, Curbside Express orders, and gift cards. And, now points are redeemable for up to 20% on the total grocery bill or up to a free tank of gas! And, I get to pick how to use my perks. Perks accumulated beyond the current price of fuel or above 20% are available for a later time. Free gas or discounted grocery bill! That's extra money in our pockets and more food on our table. Several years ago, I realized that my kids didn't quite grasp that things we did and have are not typical. It was also about the time my mom went into a nursing home. Having a parent in a nursing home puts a damper on family gatherings. And, it does not help that the Husband has worked every Thanksgiving for the last four years. A big Thanksgiving dinner with all the trimmings ended. Instead of trying to force a celebration, the kids and I opted to volunteer instead. Our Thanksgiving tradition grew into a year-long commitment which includes gathering donations. Shopping at Giant Eagle for donation items is convenient but we also get something in return besides helping others. 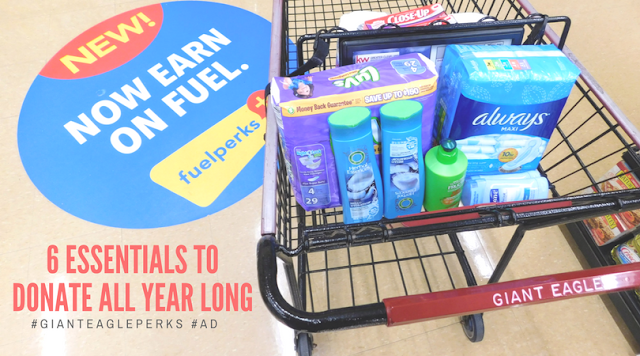 When it’s time to redeem Fuel Perks, we can look forward to $0.10 off per gallon of gas OR 2% off our groceries. Are you part of the Perk Program? You will need to have a Giant Eagle Advantage Card to track when you earn and redeem perks. If you’d like to sign up for one, visit the Customer Service desk at your neighborhood Giant Eagle. Register in less than five minutes for free! Or, register by phone; call 1-800-553-2324. If you don't have an advantage card and would like to sign up to track when you earn and redeem perks, you can visit the Customer Service desk. Or, you can register by phone; just call 1-866-620-0216. Volunteering during the holiday's is not always as easy as it sounds. Many shelters and meal kitchens cut off new volunteers because they are too busy to train. Also, volunteer spots fill up fast. Collecting donations while shopping is a great way to give during the holidays and all year long. Whenever we shop for our weekly needs, we add a few items that will go towards a donation. Nonperishable items are always needed since they are not covered by food programs. I never really considered what a luxury it was to be able to run up to the store and grab a box of pads or tampons once a month. But, it really is a luxury. When I hear personal hygiene I immediately think of deodorant. I think it's because I have a kid who enjoys her stinky musk. I, however, do not. I remember being short on cash when my youngest was a baby. I was beside myself on how to pay for diapers. Thankfully, a friend happened to have diapers that her baby had outgrown. She had no idea when she stopped by with the diapers how much I needed them. I think I cried. Nobody likes a yuck mouth. Imagine going for an interview and not having a toothbrush or toothpaste! Shampoo, conditioner, combs... you know! All those wonderful things that make us feel good and clean. Having a good night out with the family is essential. What's life without a little fun? Or the opportunity to pick out new clothes and toys. ...More Perks, More Places, More Savings. Learn how the Perks Program works and get 100 bonus perks by clicking here!